With a prescriptive blend of science, personal anecdotes, and advice, Carson shares what he has gleaned on the front lines, helping thousands of people overcome brain-based conditions and mood disorders including ADD, anxiety, depression, psychological trauma, and more. 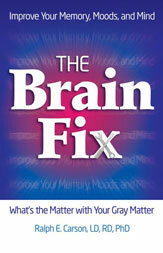 In The Brain Fix, Carson reveals an arsenal of proven tools and techniques that help regenerate new cells and connections in the brain. He shares a myriad of simple changes to make in your environment, diet, sleep habits, exercise routines, and emotional life that will yield both immediate and long-term changes to your brain. How to rewrite your genetic blueprint when it comes to decision making, impulse control, creativity, and mood stabilization: Although genetics play a key role in individual susceptibility, vulnerability, and capacity to heal from brain-based disorders, heredity is not necessarily destiny. Learn the best practices to follow that can rewrite your brain's blueprint and put you in control. How to feed your brain for optimal functioning: Discover how to fuel your brain with the right foods and supplements that foster brain plasticity—foods which can reverse years of damage from poor diet, addictions, or eating disorders. How to be mindful and why it matters: Discover why being mindful can aid in poor decision making and a lack of impulse control and how to master this elusive skill. How to alter your stress response. Learn how chronic worry can take a toll on your brain; by learning how to control your stress response, you lessen the the damaging effects of the daily grind. How to design a brain-friendly environment: While the modern world offers many conveniences, it also assaults your brain on a daily basis, sapping it of its full potential; learn some key fixes for your home and habits. Oftentimes the work we choose to do in this world is born out of our own personal journey. That's the thought I contemplated when I embarked on this project to explore the many ways to help the brain heal from the diseases and situations we often encounter that can injure it. Along my life's journey, brain injuries from mild to fatal have affected many of my loved ones. When I was a teenager, my mother passed away suddenly and unexpectedly from a cerebral hemorrhage (which causes bleeding in the brain) at the age of forty-four. Her mother was diagnosed with dementia in her early sixties. Several of my close family members struggled with alcoholism, nicotine, and other drugs of abuse that can harm the brain. And my sister died at a too-young age from a devastating form of brain cancer called glioblastoma multiforme. I originally planned to attend medical school. So in the early 1970s, I pursued a premed degree at Duke University. Perhaps because of heavy competition (or from being a poor standardized test-taker—I had a high grade-point average but a poor score on the medical college admission test), I didn't qualify at any of the medical schools to which I applied. I later earned a doctoral degree in nutrition from Auburn University. Since then, I have spent my entire career investigating how lifestyle behaviors affect brain function, psychological disorders, and neurological healing. In particular, I've spent a great deal of time counseling people with eating disorders and addictions, both of which can leave an impact on the brain's ability to work properly. While most people realize that nutrition, exercise, and sleep affect our bodies from the neck down—contributing to diseases such as heart disease, diabetes, cancer, and arthritis—fewer understand how these factors affect the health of the mind and brain, too. The typical American lifestyle encourages inflammation to run rampant, and the inflammatory chemicals that erode tissues and upset well-balanced processes in your body also affect your brain. Cardiovascular disease affects millions of Americans, and when blood isn't flowing properly through your arteries, it can affect your brain's health too. Furthermore, while it's easy to envision how strokes and head injuries can injure your brain, not as many people have a good grasp on how more subtle insults can harm it. These include addictions, obesity, eating disorders, and lifestyle choices. Even anxiety and depression, which are very common in our society, can leave your brain in need of healing. As a result, most of us have something going on in our lives that could harm our ability to think clearly. Thus, this book is intended for everyone who has a brain. I will talk a fair amount about addiction, obesity, and eating disorders in these pages simply because I have spent more than thirty years treating them. If you are trying to get past any of these problems, this book is for you. But if you've ever struggled with depression or anxiety, this book is for you, too. If you've watched older relatives disappear into a mental fog because of Alzheimer's or other types of dementia and you want to avoid their outcome, this book is for you. And if you've simply fallen into a sedentary lifestyle and unhealthy diet like so many other Americans, this book is also for you. All of us can reap the rewards of giving our brains a tune-up. 'But what can I do to fix my brain?' you might ask. On one hand, your brain is the most complex of organs. It's locked away in your skull like a treasure in a safe. It's not a relatively simple body part like a bone, which you can strengthen with more calcium and vitamin D. It has billions of cells that work together to become more than the sum of their parts. Your brain gives you the consciousness, reason, and higher thinking ability that make you human. It's a creation that mankind has barely begun to comprehend, even with our wisest of philosophers and our most high-tech MRIs, PET scans, and other imaging devices. This is all true. Your brain is special. But the same rules that govern the health of the rest of your body apply to it, too. Helping your brain heal isn't especially difficult, even when it has become dysfunctional from a lifetime of injuries, insults, and lack of proper care. In these pages, I'll be sharing with you many of the discoveries that leading experts have made in recent years for better understanding how the brain works in illness and good health. Though I've experienced a great deal of success during my career in helping people turn away from addictions and other health threats, my goal when I began was to find a cure for them and work myself out of a job. I often tell people that aside from antibiotics and chemotherapy, medicine isn't able to cure disease. Instead, the body cures itself if we give it the supplies it needs. Good nutrition, the right supplements, the right amount of exercise and sleep, and the proper mental outlook can bring balance back to your body and brain. Needless to say, given that so many people still don't have this information, I have work yet to do. I consider this book to be part of my mission. We are all challenged to make the best of our time on Earth, and the one goal we universally seek is happiness. What makes me happy is guiding people toward better health by sharing what I have learned over these many years. By restoring your brain to its peak-possible condition, you'll be able to enjoy a happier life, too. Your brain is quite fixable; it's not stuck in place, unchangeable. Your brain is mysterious, but you can still understand it well enough to steer it back to health. The same is true of your mind, which goes hand in hand with your brain. My hope is that when you become more familiar with your own brain, you'll be encouraged to use the simple tools that I offer in 'The Brain Fix Toolbox' sections throughout the book in your daily life. With your 'fixed' brain you can improve your quality of life by thinking more clearly, enjoying a sharper memory, feeling happier and less stressed, and being in control of your habits. These improvements can occur quickly—and they can be long-lasting. By making these changes now, you'll have a better chance of preserving all these qualities even later in life when dementia and difficulty thinking clearly tend to become a concern for many people. Ralph Carson, LD, RD, Ph.D., has been involved in the clinical treatment of addictions, obesity, and eating disorders for over thirty years using a neuropsychobiological approach. With a BS from Duke University and B.H.S. from Duke University Medical School, coupled with a BS in nutrition from Oakwood College and a Ph.D. in nutrition from Auburn University, he offers a unique understanding of health, wellness, exercise, and nutrition and how they all affect brain health. He currently consults with numerous addiction and eating disorder treatment centers throughout the country as well as being a highly sought after speaker at various conferences and workshops. He is an active board member of the International Association of Eating Disorder Professionals (IAEDP). Working with Academy Medical Systems, he developed workshops for professional groups throughout the U.S. on topics such as exercise therapy, sports nutrition, eating disorders, and childhood obesity.